Tricia's Take: OOTD- A Pezza for your thoughts? OOTD- I'm feeling red-dy for today! OOTD- A Pezza for your thoughts? Feels like I'm Falling for Fall! My chandelier is found here and the vase is found here. I got all my vinyl here, and my pinboard is here if you want more of the deets! You look adorable, as always. You have a beautiful home! I WANT that kids' play room for myself! I think that cardigan is one of the cutest pieces ever! Your kitchen is gorgeous, and love the chevron in the playroom! Love that cardi with the pezza dress, I'm so going to have to copy it!! And cute house pics! You look super cute!! 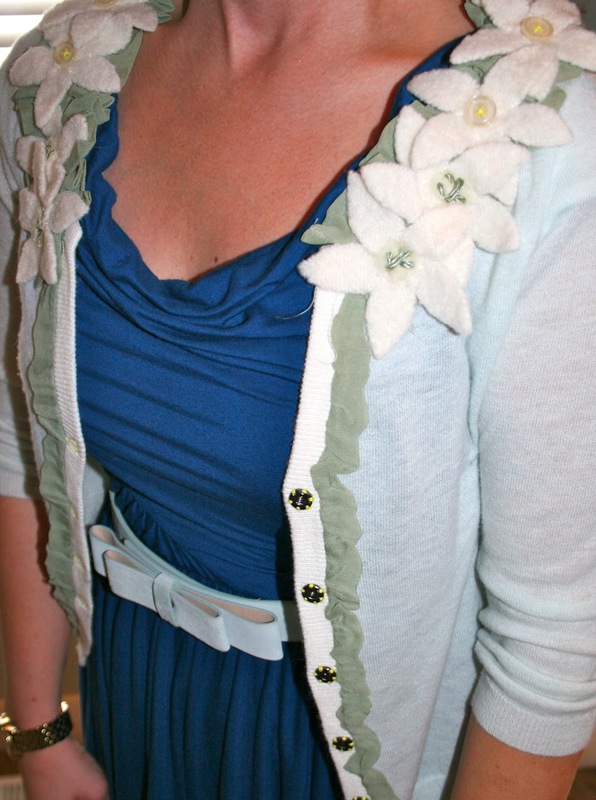 I love the details on the cardigan. I love that cardigan paired with the Pezza. Reminds me of the coast, all those serene colors! I love your kitchen! Your cabinet color is about where mine are in the staining process right now. I'm trying to get a shade darker, into espresso territory...if they'll ever DRY!! I love the rug in your kids play room too. Darling! So jealous about your trail running...I SO miss that about UTah. I LOVE this outfit Tricia. It might be one of my very favorites that I've seen you wear (and I love a lot of your outfits). The color combination works together perfectly and the blue belt ties the whole look together. Love your outfit especially that cardigan! It's so chic. You have a fabulous blog and I am your newest follower! Hope you have a fab day! What a pretty outfit! You look great! I also love your home. The kitchen is warm and inviting! The kids room looks totally ready to host eons of playdates! 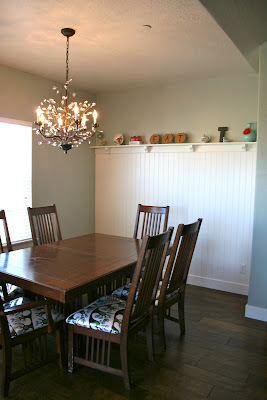 And the dining room is lovely! Congratulations to you and your family on the move! love this combo you have going on here! Love your style! I have to tell you how I found your blog, my name is Tricia (I know it says Daisy, that is a story) anyway I am pondering how I want to decorate our new place, so I finally just gave up and googled Tricia's Dream Room, and found you...ha ha ha, isn't that cute. Since I started following I wanted to say hello. LOVE your pictures, the chairs you have in your kitchen bar are like the ones we had in out old dining-room (only ours were chocolate), now they are my sisters. Cute outfit your are beautiful! Love that play room rug, where did you get it? What a pretty, feminine outfit! I love the details of this look, the darling belt and cardigan and those great shoes. Seychelles make some of my favorite and most comfortable pairs.